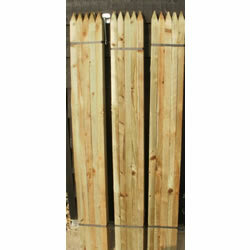 10 New x Scandinavian HC4 pressure treated pointed timber tree stakes 1.5m tall by 32mm square at a fantastic price. They have a multitude of uses from light fencing, staking trees, electric fencing, allotments, keeping the dog in, chicken runs etc. Sold & dispatched by Farm and Garden Supplies.